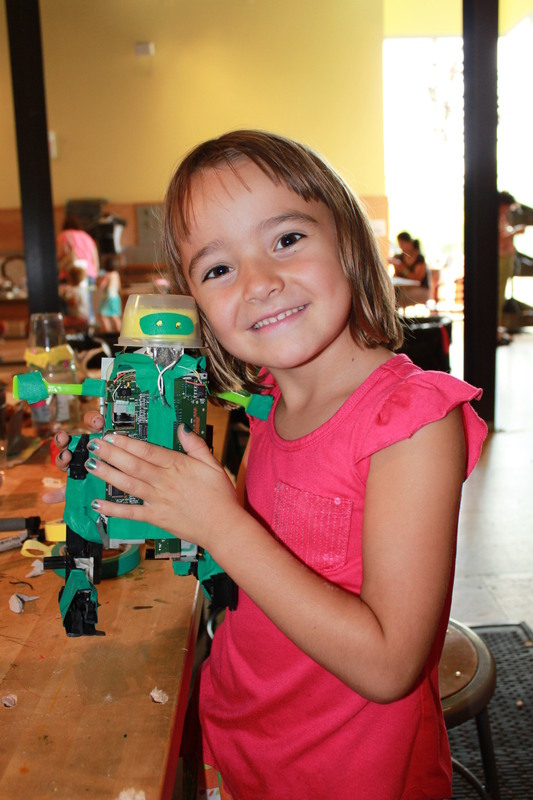 Robots are a common theme here at MAKESHOP. We have robot sculptures overlooking our area. We live in what is ostensibly the robot capital of America. On her last day, one of our summer interns made a robot pillow to remember us by. Robots are, let’s face it, just plain awesome. Unfortunately, they also get repetitive after a while, which is why I’m always excited to see a new twist on the ‘bot building. 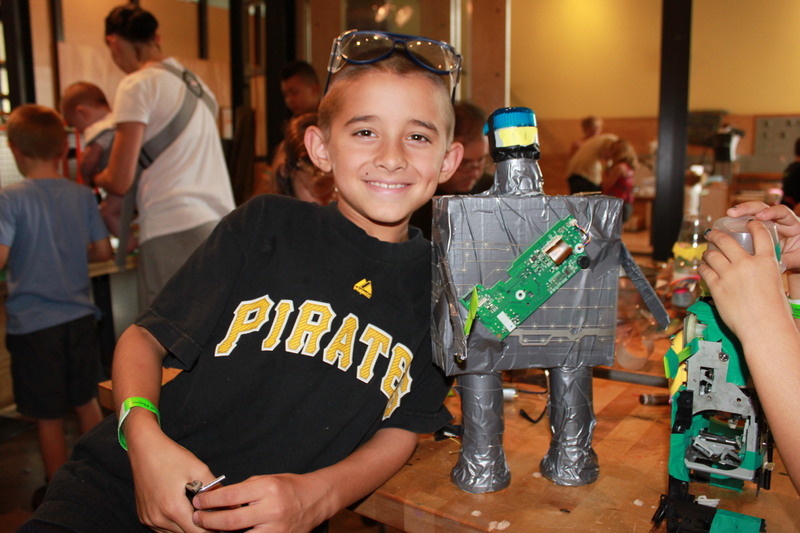 These two robots, built by a pair of siblings, were particularly well-crafted. The kids worked for quite some time to find pieces that suited the look they wanted, fit together nicely and that wouldn’t throw off the robot’s ability to balance. Both creations were able to stand on their own two feet, despite incorporating some heavy mechanical components, salvaged from old computers and printers. The kids arrived during an open-building time and didn’t initially have a plan, but they were able to iterate and change their designs in order to create something that met both aesthetic and practical requirements. 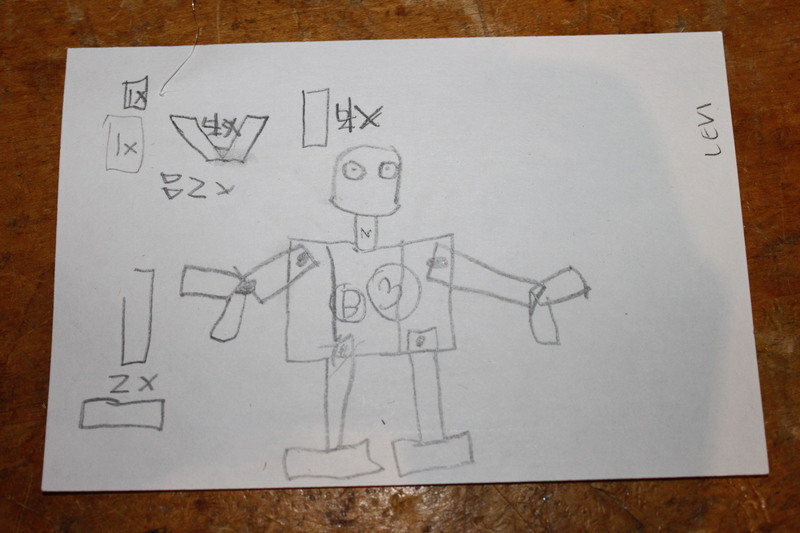 When Levi visited we were running our woodshop and, like all of our visitors who want to use the tool area, we asked him to draw a quick sketch of his project so that we could have something to work from. A quick glance at his paper showed that this was not a normal sketch: this was a blueprint. 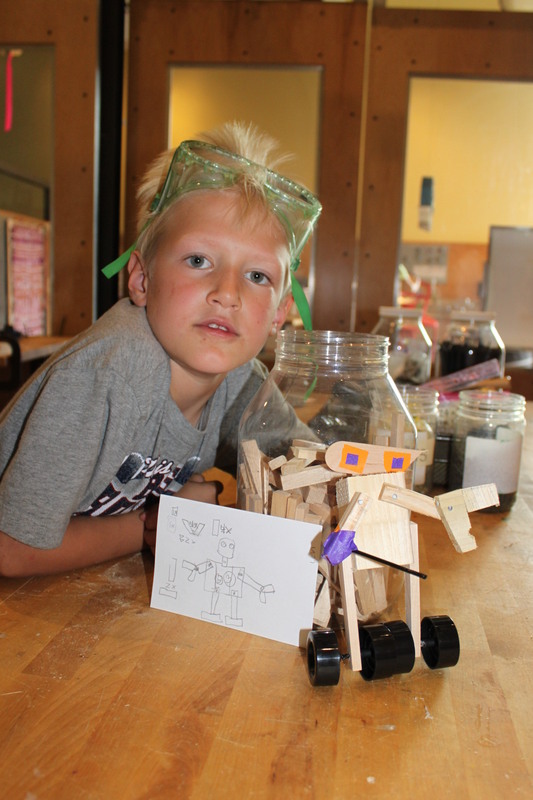 While designing his robot, Levi was reminded of LEGO building kits and games. In the world of toy building bricks, projects are broken down into component parts and include an itemized list of everything you’ll need. Since this wooden toy was going to be assembled out of smaller parts, it made sense to him to break the project down in the same way. Some changes had to be made, of course, since we didn’t have pieces that exactly matched his specifications, and we made some decisions along the way that affected the final product. We found some wheels, for example, were just a far more interesting option than feet. The neck was scrapped as unnecessary, and when one of the hands split apart he felt a laser gun would be a good substitution, since he had limited time left to rebuild a hand. We hold the design process near and dear to our hearts, here in MAKESHOP, from brainstorming and pre-planning to prototyping and iteration to craftsmanship and finalization. The most fulfilling projects, for us and for the makers that visit us, are usually the ones that go through most or all of these, taking time to consider each step from inception to production.